On Tuesday afternoon local time, eight people were killed when a truck drove along a cycle path in Manhattan.It is the deadliest terror attack in the city since nearly 3,000 people were killed on 11 September 2001.A full picture is starting to emerge of what happened, and of everyone involved. Computer science student Babatunde Ogunniyi, 29, was in lower Manhattan at about 15:00 local time (19:00 GMT) on 31 October when he saw the attack unfold. "We were sitting outside of college, and I saw this truck coming, revving and swerving," he told the BBC. "He was going maybe 60 or 70 mph, in an area where the speed limit is 40 - it's a very congested area with lots of people. "It hit the two people, I saw it hit them. Then he continued to drive down the walkway and bike lane. It hit a school bus and veered left. "People started running towards the truck to see what was happening, and then the gunshots went off and everyone ran in the opposite direction." Police said the white pick-up truck, rented from retailer Home Depot, struck cyclists and pedestrians while being driven along the West St-Houston St path for many blocks.In all, eight people were killed and at least 11 injured. Four of those hurt were in the school bus - two adults and two children. New York Police Department (NYPD) Commissioner James O'Neill said the truck driver emerged holding what appeared to be two handguns and made a statement "consistent with a terror attack".The suspect reportedly shouted "Allahu Akbar" ("God is greatest") as he left the truck but police have not confirmed exactly what was said.The driver was then shot in the abdomen by a police officer stationed near the scene - one witness said he heard nine or 10 shots fired at the suspect, another said five or six. The suspect later underwent surgery for bullet wounds, and a paintball gun and a pellet gun were recovered from the scene.On Wednesday, New York Governor Andrew Cuomo told CBS that a note was found inside referring to the Islamic State militant group.Mr O'Neill praised the actions of the police officer stationed at the school, named in the press as Ryan Nash, 28. 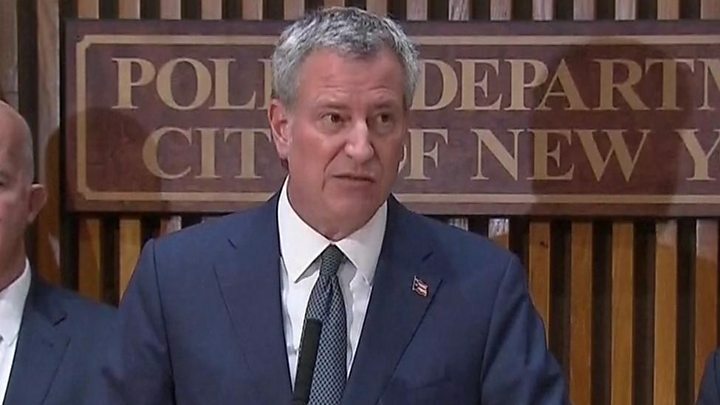 "I want to commend the response of our NYPD officer that was on post near the location who stopped the carnage moments after it began," he said. The NYPD said only that the attacker was a 29-year-old man.However, US media named him as Sayfullo Saipov, who had reportedly lived in Tampa, Florida, and Paterson, New Jersey.He arrived in America from Uzbekistan in 2010 and is believed to be a legal resident in the country. A police source told Reuters he was not a US citizen. "He was a very good person when I knew him," Kobiljon Matkarov, an Uzbek national in Florida, told the New York Times. "He liked the US. He seemed very lucky and all the time he was happy and talking like everything is OK."He did not seem like a terrorist, but I did not know him from the inside." Who is New York attack suspect? Mr Matkarov told the Tampa Bay Times that Mr Saipov was married and had two or three children.Car-share service Uber confirmed Mr Saipov had been working for them, and had passed its background checks. The company said it was "horrified by this senseless act of violence".Three officials said Mr Saipov had previously come to the federal authorities' attention as a result of an unrelated investigation, the New York Times reported.Police records show he was arrested in Missouri last year over a traffic fine. Uzbek nationals have been behind a number of terror attacks in the past 18 months. In April, Rakhmat Akilov drove into a crowd in Stockholm, Sweden, killing four people and injuring another 15.On 31 December last year, Abdulkadir Masharipov killed 39 people in a shooting spree at the Reina nightclub in Istanbul.In June last year, two Uzbek nationals are believed to be among the three people who attacked Istanbul's Ataturk airport, leaving 44 people dead and 230 others injured.Uzbekistan's president, Shavkat Mirziyoyev, has told Donald Trump his country was ready to "use all forces and resources" to help investigate the deadly attack. However, Uzbek officials have not yet confirmed the identity or nationality of the attacker. The deaths of the five Argentines were confirmed by the country's foreign ministry. They were part of a group of nine friends in New York to celebrate the 30th anniversary of their graduation from a polytechnic college in the central city of Rosario, Argentine media said.The men - all reportedly aged 48 or 49 - were named as Ariel Erlij, Diego Enrique Angelini, Alejandro Damian Pagnucco, Hernan Diego Mendoza and Hernan Ferrucci.Another of the friends, Martin Ludovico Marro, is being treated in hospital but the extent of his injuries is not known.Erlij, a steel firm owner, helped pay for the friends' trip, La Nacion newspaper reported (in Spanish). He was not able to fly out with his friends, and travelled to New York a day later by private plane, the Rosario newspaper La Capital reported.In a photograph widely used by Argentine media outlets, eight of the men were seen together at the airport in Rosario, arms over each others' shoulders, wearing T-shirts saying Libre (Free).La Capital said that early in their trip, they had travelled to Boston to spend time with Marro, who lives in the city. They then travelled down to New York and decided to cycle along the path near the World Trade Center.The newspaper said that one of the group was cycling ahead of the others when he heard a loud noise. When he turned around, he saw that almost all his friends had been run over.A number of Argentine newspapers named three of the other survivors as Juan Pablo Trevisan, Ivan Brajkovic and Ariel Benvenuto.Three days of mourning have been declared in Rosario, Clarin newspaper reported. President Mauricio Macri expressed his "deep condolences" for the victims' families on Twitter.One Belgian national was also killed and three others injured, Belgium's foreign minister said.Two other victims have not yet been identified.